Sweet Diane, a tasty third in Oaks! Redbank North going in right direction! Artilena the real Ontario Lassie! Calgary Caper an emotional winner of the G3 BC Premier’s Handicap! “More to Come” from Anderson Farms bred Sergei Prokofiev! Mr. Havercamp a champ for the Fitzhenrys! Bay Success A Long Time In The Making for Dave Marnane! Marette proves dominant with Alpha! Madison and Mimi nice winners! “Special” filly a rising star! New career for The Pamplemousse! “Fun day” in the snow! Anderson Farms in incredible numbers! Flying high for Mt Brilliant! Million plus for Anderson Farms! Collected a Pacific Classic champ! Anderson Farms on a roll! Nice price for the Nygaards! Peter Fluor big on Collected! Share available in exciting purchase! Sweet Loretta a tasty GIII winner! “The Rocket!” – another stunner for Speedway! Good news about La Bruna Forte! Stallion Heiress takes the Spanky! Farrell, Adger, Speedway Australia trip in TDN! Debonairly does it for Speedway! A super run for Exhale! More Mt. Brilliant at the DRF! Aragonite zips to victory for Donk and co! Filly for Waterhouse and Speedway! Hard Not to Like goes for a symphony! Big price sale at Fasig Tipton! Hard Not to Like, Blood Horse Cover Girl! St Elias Stable’s GISW Sweet Loretta (Tapit) made her 2017 debut a winning one and remained undefeated around one turn with a convincing score in Keeneland’s Sunday feature, the GIII Adena Springs Beaumont S. The bay’s triumph marked the 50th Keeneland stakes win for trainer Todd Pletcher, equaling the record set by his mentor D. Wayne Lukas. Sweet Lorretta skimmed the rail and rallied to win clear from gritty longshot Sine Wave (Big Brown). Sweet Loretta broke her maiden at first asking at Monmouth last June and shipped north to capture the GIII Schuylerville S. on Saratoga’s opening day in July. 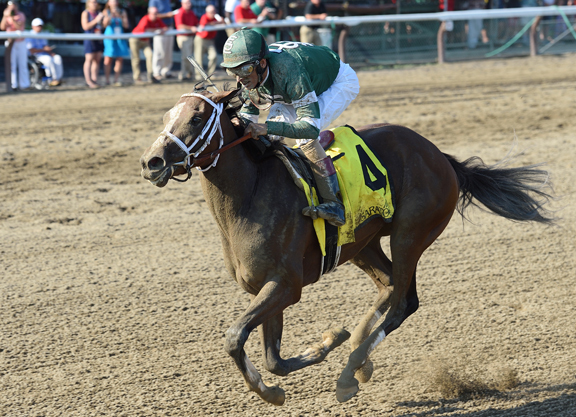 The filly capped off a fantastic summer by dead-heating Pretty City Dancer (Tapit) for the win in the GI Spinaway S. over seven furlongs Sept. 3. Trained up to the GI Breeders’ Cup Juvenile Fillies following that effort, she encountered significant early trouble and faded to finish 11th, beaten 12 lengths by Champagne Room (Broken Vow). Sweet Loretta returned to the worktab in late February and trained steadily at Pletcher’s winter base at Palm Beach Downs. Tabbed as the clear favorite for this cutback to a sprint distance, the $750,000 Keeneland November weanling purchase was allowed to settle off the pace in the early stages and quickly advanced to secure a spot stalking the pace along the rail behind a quarter-mile in :23.47. Holding her position in search of running room around the turn, she punched through a generous opening cornering for home and kicked clear to open up a decisive advantage by mistretch. Despite drifting out a bit late, Sweet Loretta reported home a clearly best winner. The previously unbeaten Sine Wave raced up close early and stayed on well down the lane to complete the exacta. When asked about future plans for the filly, DePasquale said that Pletcher and owner Vincent Viola will discuss the best course of action. Dancing Rags (Union Rags), winner of the GI Darley Alcibiades S. here last October, raced towards the back of the pack and never factored in a sixth-place finish. Like Sweet Loretta, it was her first start since a dull eighth-place finish in the Breeders’ Cup Juvenile Fillies. The winner is the first foal out of a half to Canadian champion and GISW Spring in the Air (Spring At Last). Second dam Unbridled Run (Unbridled) is a half to MGSW Tejano Run (Tejano), who was second in the 1995 GI Kentucky Derby. Sweet Loretta has a juvenile full-brother who sold for $450,000 as a KEESEP yearling and a half-sister of 2016 by Street Sense. Ithinkisawapudycat was bought by Mount Brilliant Farm for $2.2 million in foal to Constitution at last term’s Keeneland November sale. She is also responsible for a 2015 colt by Tapit and a 2016 filly by Street Sense.